Marine Major Aric "Walleye" Liberman was uncharacteristically modest for a Navy SEAL turned fighter pilot. He had just landed an F-35--one of the 2,457 jets the Pentagon plans to buy for $400 billion, making it the costliest weapons program in human history--at its initial operational base late last year. Amid celebratory hoopla, he declined photographers' requests to give a thumbs-up for the cameras that sunny day in Yuma, Ariz. "No, no, no," he demurred with a smile. Liberman's reticence was understandable. For while the Marines hailed his arrival as a sign that their initial F-35 squadron is now operational, there's one sticking point. "It's an operational squadron," a Marine spokesman said. "The aircraft is not operational." 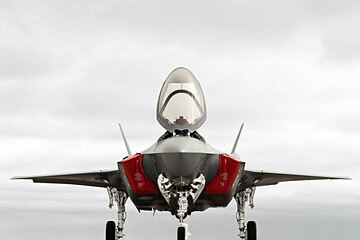 The F-35, designed as the U.S. military's lethal hunter for 21st century skies, has become the hunted, a poster child for Pentagon profligacy in a new era of tightening budgets. Instead of the stars and stripes of the U.S. Air Force emblazoned on its fuselage, it might as well have a bull's-eye. Its pilots' helmets are plagued with problems, it hasn't yet dropped or fired weapons, and the software it requires to go to war remains on the drawing board. That's why when Liberman landed his F-35 before an appreciative crowd, including home-state Senator John McCain, he didn't demonstrate its most amazing capability: landing like a helicopter using its precision-cast titanium thrust-vectoring nozzle. That trick remains reserved for test pilots, not operational plane drivers like him. The price tag, meanwhile, has nearly doubled since 2001, to $396 billion. Production delays have forced the Air Force and Navy to spend at least $5 billion to extend the lives of existing planes. The Marine Corps--the cheapest service, save for its love of costly jump jets (which take off and land almost vertically) for its pet aircraft carriers--have spent $180 million on 74 used British AV-8 jets for spare parts to keep their Reagan-era Harriers flying until their version of the F-35 truly comes online. Allied governments are increasingly weighing alternatives to the F-35. But the accounting is about to get even worse as concern over spending on the F-35 threatens other defense programs. On March 1, if lawmakers cannot reach a new budget deal, the Pentagon faces more than $500 billion in spending cuts in the form of sequestration, which translates into a 10% cut in projected budgets over the coming decade. Two years ago, the White House predicted that those cuts would be so onerous to defense-hawk Republicans that they would never happen. But the GOP is now split, with a growing number of members who are more concerned about the deficit than defense. "We are spending maybe 45% of the world's budget on defense. If we drop to 42% or 43%, would we be suddenly in danger of some kind of invasion?" asked Representative Justin Amash, a Michigan Republican and part of a new breed of deficit hawks who talk of spending as a bigger threat than war. "We're bankrupting our country, and it's going to put us in danger."